One of the most wonderful encounters you can have underwater, while diving Catalina Island or the Channel Islands, is with a Giant Black Sea Bass (Stereolepis gigas). Also known as Giant Sea Bass, these protected, gentle giants can be over 6ft long. They are curious and have been known to closely approach divers. The official range of black sea bass is Baja to Northern California, but they are rarely seen outside of Southern California or north of Point Conception. 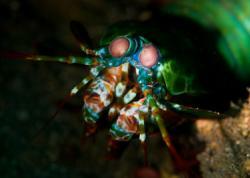 Juveniles have been seen in sandy areas of the La jolla and Redondo submarine canyons. There are 2-4 inches long, and usually hover over the sand remaining in a small area. Adult black sea bass are found around La Jolla, San diego; the Santa Monica Bay; and Catalina and Anacapa islands. 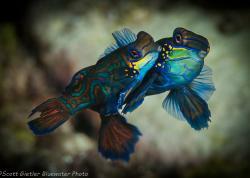 They can be found in singles or pairs cruising a large area, or in mating groups of 5-20 fish staying in one area. 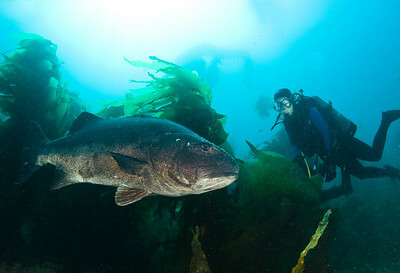 One of the best places to see Giant Sea Bass is at the Casino Point dive park in Avalon on Catalina Island, swim to right towards the SueJack wreck at 50ft depth. Black sea bass mating aggregation at Catalina Island, 11 fish total. 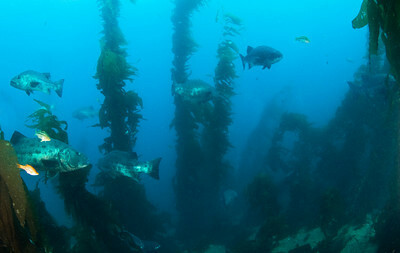 At Catalina and Anacapa Islands, Black sea bass like to cruise where the kelp meets the reef, usually around 40-65ft deep. 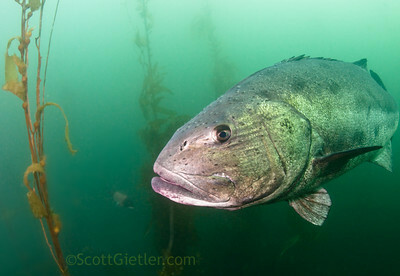 Black sea bass are quite large, so a fisheye lens or a 12-24mm focal length will work well. Get low, shoot up and be ready because sometimes these fish just make one quick, close pass. 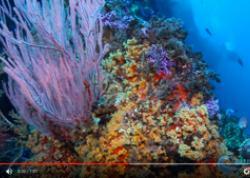 Underwater photography is best at locations where they are mating or getting cleaned, but those can move around year to year. There are magical moments in one's life that you savor for a long time. One occurred last Wednesday for me and my dive buddy, Vicki Durst, while diving underwater (under permit) in Lover's Cove, Catalina Island. We were between Abalone Point and Ring Rock in a beautiful kelp bed following two black sea bass slowly winding their way through the kelp obviously in courtship. My favorite poet, Robinson Jeffers, once said "the happiest and freest man [or woman] is the scientist investigating nature, or the artist admiring it." Both of us felt that way on this dive! When I first started diving Catalina waters in the late 1960's, the giant or black sea bass was largely a legend. Commercial and "sport" fishing in the late 1800's and early 1900's had greatly reduced populations of "jewfish" (their "politically incorrect" former name) in southern California. Later, SCUBA diving spearfishermen found them an easy target, and they were killed as "by-catch" in gill nets. My "sightings" in those days were limited to pictures in the Museum of these fish hanging dead next to their smiling angler. Within the past decade or two, divers began seeing juveniles in our waters. Large fish began appearing at various places around the island including the Casino Dive Park and Lover's Cove. Each year brings more sightings and new locations for them. Even snorkelers and passengers on the glassbottom boats see them in Lover's Cove. Thanks to California protections placed on these fish banning commercial fishing (1982), sport fishing (1983) and gill netting (1993), they appear to be making a significant comeback. Currently the most serious danger appears to be from fishermen taking them (hopefully unaware of their protected status). Reports of filleted black sea bass on other islands, and living fish with spears in them or scars from recent attacks here and elsewhere are documented. They are occasionally caught accidentally by fishermen, especially when in the shallows to spawn. 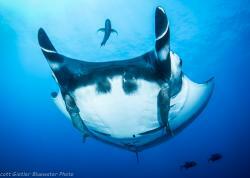 Some believe that their swim bladders must be punctured so they can return to their usual depths. However, puncturing the swim bladder may also lead to life-threatening infections. 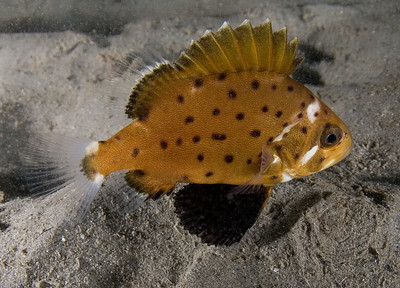 These fish were formerly found from Humboldt Bay to the Gulf of California (Sea of Cortez), being somewhat common from Pt. Conception south. 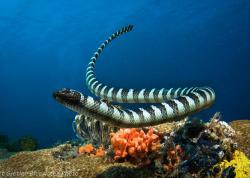 Most are seen in depths of 20-150 feeet over rocky reefs and in kelp beds. Although known as black sea bass, this is largely because they turn dark upon death, and most of our early information about them comes from descriptions by anglers and historical photos. In life they may be silvery, silver with dark spots, or a more uniform dark color and individuals may change color pattern. The oldest fish scientifically aged was 75 years old and weighed 435 pounds, although the size-age relationship depends on food availability and other factors. Black sea bass are believed to live over 100 years, reaching lengths of 7 1/2 feet. In 1910 conservationist Charles F. Holder (co-founder of the Tuna Club) said 800 pound individuals were being taken off Catalina and pressed for their protection. Juveniles are about a foot long after two years, and become sexually mature at 11-13 years and 50-60 pounds. Fish specialist Dr. Milton Love said a "small" 320-pound female had an estimated 60 million eggs. The groups of 2-20 individuals seen at various island locations are believed to be mating, which occurs primarily between June and September. These massive fish feed on smaller fish of many species, lobster, crabs and squid. I wouldn't be surprised to learn that the black sea bass in Lover's Cove are attracted to the large numbers of opaleye and kelp bass being fed by the glassbottom boats. At Italian Gardens I observed schools of small senorita apparently cleaning parasites off their heads and gills. I can attest that our local individuals are well-fed. Earlier this summer I captured over three minutes of continuous footage of a very large black sea bass, following it as it swam through the Casino Point Dive Park. When I came home and reviewed the footage, I discovered this fish had pooped on me, releasing a copious amount of digested food... something I hadn't seen in my small camcorder viewfinder while following it! I thought I had discovered the source of our previous beach bacteria problem, which seemed to coincide with the recovery of this huge species. I am reminded of a story Jean-Michel Cousteau once told me. He had just completed a lecture and a little girl in the audience raised her hand and asked "Mr. Cousteau, how can you swim in the ocean with all those fish poopies?" A wise young lady based on my recent experience!